Further information obtained regarding the floating pumice rafts between Tonga and Fiji indicated that the source was Metis Shoal. Mariners in the region were being informed of this activity in early September via "Rag of the Air" radio broadcasts from Fiji. The earliest report found to this point comes from a boat with callsign KB1LSY, noting that "thick pumice" slowed them for 30 minutes during the early morning hours of 28 August as they were approaching the northern islands of the Lau Group in Fiji, about 500 km NW of Metis Shoal. By 15 October yachts sailing between Tonga and Fiji reported no remaining pumice. On 7 December 2006 the Royal New Zealand Air Force (RNZAF) flew over the Home Reef and Metis Shoal area of Tonga at the request of volcanologists from the Institute of Geological & Nuclear Sciences (IGNS). At that time an island was present (figure 4), but it is not known if this is a remnant of the island built in 1995 (BGVN 20:06) or the result of later undocumented eruptions. Areas of discolored water were present adjacent to the island, the result of either erosion or fumarolic activity. Discolored water extending about 5 km SW from the location of the island was also observed in an Aqua MODIS satellite image taken on 15 September 2005 (figure 5). Figure 4. Photograph of Metis Shoal, 7 December 2006. Courtesy of the RNZAF and IGNS. Figure 5. Satellite image (Aqua MODIS) from 15 September 2005 showing discolored water extending about 5 km SW from Metis Shoal. Image has been color-adjusted to enhance water discoloration. Base image courtesy of NASA Earth Observatory. Information Contacts: Brad Scott, Institute of Geological & Nuclear Sciences (IGNS), Wairakei Research Centre, PO Box 2000, Taupo, New Zealand (URL: http://www.geonet.org.nz/, http://www.gns.cri.nz/); NASA Earth Observatory (URL: http://earthobservatory.nasa.gov/). Ship reported sighting eruption at 3 a.m. on 12 December 1967. Undersea volcanic eruption building itself above the surface. By January 6th, island had built itself to be 150 feet high and one mile long. no scientific investigation being conducted to date. The following reports are ordered by report number with the date of the activity in brackets. The date the report was issued is in parentheses. Violent eruption throwing lava 1,000 feet into the air with steam and smoke billowing to 4,000 feet and higher. Island is half a mile wide and 100 feet high. Reported from the deck of the Tufoa, 13 miles from eruption. Flames leaping above horizon. We were 17 miles away. We altered course toward glow. As we approached we saw lumps of lava being hurled into the sky. We went only to about 10 miles from the eruption. It was very spectacular with flames and lava fountaining to about 1,000 feet. The night was clear and clouds of white smoke were quite visible at about 3,000 feet. There was no noise but we could see the flames about two hours after we left the area. We sent out a report to any ships in the vicinity. Continuous violent activity which has increased in intensity, eruptions approximately 90 seconds apart. Report from the deck of the Hifofua, 15 miles away. Notification Report (02 January 1968)Sidney Galler, SI; Washington Post (14 December 1967); Science News (6 January 1968); Tonga Chronicle (15 December 1967). Information Report 1/1a [12 December 1967] (02 January/21 February 1968)M. Grey, 1st Officer of the Tufoa, Nukualofa, Tonga Islands. Information Report 2 [13 December 1967] (02 January 1968)Captain Olsen, Captain of the Hifofua, Nukualofa, Tonga Islands. Spectacular smoke cloud billowing thousands of feet in the air. Steady formation of new island as hundreds of tons of rock are thrown 400-500 feet in the air. Report made from aircraft chartered by the King of Tonga. Explosions were throwing rocks and steam clouds straight up in the air to a height of 400-500 feet. They were carrying smoke to the west and up to a height of 2,500 feet. Smoke clouds were over one mile long. Report made by pilot of airline charter aircraft that flew over volcano on second day of eruption. Flew at about 300 feet. No material from eruption was going any higher than 300 feet. The rocks stuck up about 50 feet. No whirlwinds or similar phenomena were noted. No lightning or unusual static was noted. No other shoals were noticed in the area. Report of personal interview by Dr. Charles Lundquist. Activity reduced scale with rocky outcrops over half-mile area. Area now low elevation very rocky island one mile long and half mile wide. No eruption, but emitting sulfur fumes. Volcanic activity subdued. It ended about three weeks ago. Some smoke is still coming out. Island is now about one-half mile in diameter. It is possible to land a boat on the island. Smoke and steam at 20-30-second intervals; initial spurts to 500 feet. Smoke rising to 5,000-8,000 feet. Observed at distance of 70 miles. Weather clear. Location of eruption is 0.7 miles N of Metis Shoal. Ship report to Oceanographic Office. Volcanic eruptions have been reported in following positions by USS Fox at 110402Z and CCGD Fourteen at 111841Z: 1) 19°00' S, 171°00' W; 2) 19°15' S, 171°51' W; 3) 19°10'30" S, 174°51'36" W.
Metis island gone. Recent volcanic rocks collected from shoal. Relying on sight and radar estimate island 200 feet high and one mile long. Report from deck of Tufoa, 12 miles from eruption. There appeared to be seismic activity in the area about 2,900 miles SW of Hawaii. There were no immediate indications that a tidal wave [tsunami] had been generated. A lava flow did not occur, but lava pillars built up as the cool water hardened it. Once the lava could flow above sea level it hardened into rock. Below this the lava was inclined to break up into scoria and lava cones. The time the newly formed island stays depends on how long the eruption goes on. Volcanic blasts continued to spew rocks and steam. Steam belching about 300 feet high and in the center of the smoke and steam were spurts of red flame. There were some big rocks and they were making huge splashes as they fell into the sea. The island was almost entirely obscured by clouds of steam and it was difficult to estimate its size. It is solid rock and well above the surface, about 50 feet high. It was a spectacular sight. Reported by the air crew of two Royal New Zealand Air Force Orions which flew around the volcanic island for 45 minutes on the afternoon of 14 December 1967. The aircraft circled the island at 700 feet. Island is now submerged. Very high breakers on subsurface rocks. Collected stones at depth of 4 or 5 feet. Black stones on sand bottom. All smal stones moving in currents, back and forth. Saw at least one large black stone about 10 feet by 10 feet horizontal cross-section. Recovered suitcase full of recent lava for analysis. Report on visit to Metis Shoal on 19-20 February 1968; diver was Inoke Fisi of Matuku Island. Flew around the Metis Island on way from American Samoa to Tonga. There was a long trail of clouds and active eruption at the time. The material coming up was dark. No incandescence or lightning was seen. On the ocean much tephra was floating downwind. Saw rocks sticking up, perhaps more than in photos. Report from personal interview with Charles Lundquist. Observations before 1 February 1968: Thought cone had built up and that water was no longer reaching vent. Then there seemed to be clear explosions with little steam. Observations on 1 February 1968: Island one-half mile in diameter with jagged rocks and water washing across. Smoke (sulfur) and steam. Information Report 3 [14 December 1967] (01 February 1968)J. Riechelmann, Tonga Chronicle, Nukualofa, Tongatapu, Tonga Islands. Information Report 4/4a [14 December 1967] (02 January/18 February 1968)Captain Sharer, Fiji Airways Ltd., Nandi, Fiji Islands. Information Report 5 [25 January 1968] (02 February 1968)J. Riechelmann, Tonga Chronicle, Nukualofa, Tonga Islands. Information Report 6 [28 January 1968] (03 February 1968)British Consulate, Nukualofa, Tonga Islands. Information Report 7 [02 February 1968] (12 February 1968)J. Riechelmann, Tonga Chronicle, Nukualofa, Tonga Islands. Information Report 8 [11 December 1967] (05 February 1968)Mr. Binney, U.S. Navy Oceanographic Office. Information Report 9 [11 December 1967] (09 February 1968)U.S. Naval Hydrographic Office, HYDROPACK No. 2444-67, issued 161822Z Dec 67. Information Report 10 [20 February 1968] (21 February 1968)Charles Lundquist, Smithsonian Astrophysical Observatory (in Nukualofa, Tonga Islands). Information Report 11 [12 December 1967] (21 February 1968)Captain Bennett, Captain of the Tufoa, Nukualofa, Tonga Islands. Information Report 12 [13 December 1967] (21 February 1968)Lt. Cdr. James Midgely, U.S. Coast and Geodetic Survey, Honolulu. Information Report 13 [13 December 1967] (21 February 1968)James Healy, New Zealand Geological Survey, Rotorua, New Zealand. Information Report 14 [14 December 1967] (21 February 1968)Flight Lt. P.K. Simpson, No. 5 Maritime Squadron, Royal New Zealand Air Force, Aukland, New Zealand. Information Report 15 [19 February 1968] (26 February 1968)Charles Lundquist, Smithsonian Astrophysical Observatory, Cambridge, MA, USA. Information Report 16 [01 January 1968] (18 February 1968)Penisiami Tupouniua, Nukualofa, Tonga Islands. Information Report 17 [01 February 1968] (26 February 1968)C.H. Hill-Willis, Captain of the Aoniu, Nukualofa, Tonga Islands. Observations made from aircraft at distance of 1-2 miles from eruption at height of 500 feet. Observations on 24 December 1967. A solid cloud of white steam with a definite black core of lava rock was ejected. Frequency of ejections: about every 20-30 seconds. Height of eruption cloud: 2,000 feet. Length of cloud: approximately 1 mile. Color of eruption cloud: white with darker core of the ejecta. Ejecta was being thrown to a height of about 300-400 feet. The island was made of low black volcanic sand and was about 1/4-1/2 mile long, about 100-150 yards wide, and 50 feet high. Island was a low black sandy shoal with an increasing area of yellow water downwind as sulfurous spoil was deposited. Observations on 31 December 1967. The island has grown considerably . . . . [Maximum island size was reached about two weeks later.] By this date the solid eruptions had ceased and by late January the island was receeding. Observations made from the ship "Aoniu." There was no lightning and very little cloud on any of the three occasions. No water spouts were observed. No electrical disturbance was noted on our broadcast receivers. Observations on 19 December 1967. The island was 1/3 of a mile long and approximately 80 feet high. It was erupting from a single cone at intervals of roughly 3 minutes with steam vapor rising to some 8,000 feet; the first 5,000 feet was rising strongly and vertical and then the wind took effect and drifted it away to the NNW. Observations on 28 December 1967. Volcanic action still taking place but at irregular intervals. Smoke instead of steam was rising to 8,000 feet plus. The island did not appear to have increased in size. Observations on 20 January 1968. An exposed reef of about 1/2 mile in extent with a strong smell of sulfur premeating the atmosphere. Apparently this disturbance was a great attraction to fish as both tuna and albacore appeared in the area for a period of about a month. They are not there now (17 April 1968). Observations were made from the ship "Tufoa." Observations at 0840 GMT on 11 December 1967. Vessel obtained a very sharp radar echo at a distance of 13 miles which could of course be due to electrical static discharge on turbulent steam clouds ascending with considerable velocity above the island. At the closest approach of 9 miles the volcanic eruption had the appearance of an incandescent island about 1/2 mile long and 150 feet high, glowing cherry red at constant intensity. Above this island a dense pillar of steam and smoke ascended to 3,000 feet and at approximately 1-minute intervals molten lava of boulders in irregular parabolic arcs were observed being ejected to a height of 1,000 feet. Observations on 8 January 1968. Radar indicated only a small island almost awash and no volcanic activity was observed. Observations on 24 Dec 1967, 31 Dec 1967, 7 Jan 1968, 31 Jan 1968, late Feb 1968, 21 April 1968. "The island, generally kidney-shaped at its best, lay with its longitudinal axis approximately E-W. Steam clouds on that day, 31 December, were blowing in a direction of about 200 degrees true, the surface wind was from the NNE. The island was at a maximum size by about the 7th of Jan 68. "On Sunday, Dec 24th, violent eruptions were taking place. By Sunday, Dec 31st, these eruptions appeared to have reduced considerably, although still actively steaming. By Sunday, Jan 7th 1968, volcanic activity appeared to have ceased, although steam was still evident. By Sunday, 31 Jan 68, all activity had ceased, volcanic and steaming. "I would estimate that the island disappeared in the first or the second week of February. By late February I observed the sea washing over the island completely, but with waves first breaking on the edges. The appearance from 8,000 feet was mainly black volcanic sand and rock." Observation of the island beneath the sea made at 8,000 feet at 2120 hours on April 21st, 1968. "The island appears to have sunk even more. The sea was calm and the island completely covered without any appearance of breaking waves (it was about low water at Tonga). The color looked more like yellow sand as opposed to black sand, mentioned earlier. The water around about had a definite yellow tinge, suggesting a sulphur content. The coloring effects gave an impression of a discharge in the sea. The size of the island (beneath the sea) was roughly 100 yards across and circular in form. "Note: The estimate of the height of the island by Flt. Lt. Simpson of the RNZAF compares with my own estimate - 50 feet. But we both appear to be wide of the mark compared with the crew of MV Tofua. Their estimate of 100-200 feet is probably a better one, when judged from the horizontal." Information Report 18 [31 December 1967] (16 April 1968)T.M. Holmes, Polynesian Airlines Ltd., Western Samoa. Information Report 19 [20 January 1968] (17 April 1968)C.H. Hill-WIllis, Captain of the MV Aoniu, Nukualofa, Tonga Islands. Information Report 20 [08 January 1968] (17 April 1968)Peter Bennett, Union Steam Ship Company, Auckland, New Zealand. Information Report 21 (29 April 1968)T.M. Holmes, Polynesian Airlines Ltd., Western Samoa. Information Report 22 (29 April 1968)T.M. Holmes, Polynesian Airlines Ltd., Western Samoa. On 14 December 1967, two Orion aircraft of No. 5 Squadron, Royal New Zealand Air Force, flew around Metis Shoal for approximately 30 minutes. The position of the volcano was recorded as 19°09'S, 174°50'W. The recorded weather in the area was scattered to broken strato-cumulus, base 1,500', tops 7,000', with a marked wind shear and temperature inversion at 7,000'. Surface wind was from 090°T, at 13 knots with a light westerly at 10,000'. The smoke and steam from the volcano reached the inversion some 5-10 miles downwind. At the site of the eruption an island had formed and it was vigorously estimated to be 20-40 feet high and as much as 150-300 yards long. At the eastern (upwind) extremity of the island was a crater guessed to be 10-20 yards across. Its shape was circular with dark gray lips. Inside the gray soon changed to a dark cherry red, becoming brighter and more orange with increasing depth. These details were observed only momentarily when for a few seconds the smoke cleared about the crater. During this brief period the gases shooting from the crater mouth were seen to be clear and transparent. Generally both the crater and island were obscured by smoke and steam. The aircraft flew underneath the smoke trail at a height of 600' perhaps 4 miles from the site of the eruption. Numerous spots of a thin grayish material up to 1/4" across were deposited on the windscreen and a strong sulfurous smell was noticed. Lumps of dark-colored matter were being flung several hundred feet into the air. They seemed to be ejected at intervals of 10-20 seconds and they splashed into the sea in all directions out to a distance of 250 yards. This matter was clearly visible from 1/2 to 1 mile away. Occasionally a much larger piece (perhaps 2 or 3 feet across) would be seen to rise to a height of 100-200 feet. The sea water around the volcano was colored an emerald green streaked with brown. This discoloration extended several hundred yards upwind and 7 nautical miles on a bearing of 240°T from the island. Information Contacts: D. Rishworth, DSIR, Rotorua, New Zealand. A large body of floating pumice was first reported on 10 May by a Soviet vessel, in the area from 17.80-18°S and 176.45-176.67°W. On 14 May, a U.S. Naval Research Laboratory aircraft flew over continuous 30-45 m-wide patches of dirty rust-brown pumice from 17-17.45°S and 174.13-177.60°W. Four days later, the same aircraft flew over Late Island (18.810°S, 174.65°W), last reported to erupt in 1854. White material, apparently ash, covered the cone, and streaks of pumice extended back to the island from the main body of the raft [but see 4:12]. While enroute from Nandi, Fiji NE to Apia, Western Samoa on 22 May, Captain Gallagher of Polynesian Airlines observed pumice extending about 30 km SE from 16.2°S, 178.38°W. On the 24th, Captain Gallagher again observed pumice, in large areas at about 15.8°S, 177.5°W. An Air Pacific plane flew over pumice that extended about 25 km N-S and about 45 km E-W from 16.37°S, 177.63°W on 28 May. Captain F. R. Sutherland of Polynesian Airlines reported pumice between about 15.58°S, 176.50°W and 16.10°S, 178.18°W on 30 May, as he flew SW from Apia to Nandi. He first saw several long, thin, mustard-brown streaks, then the pumice became more concentrated. The largest area of pumice, about 5 x 1 km, extended NW-SE and tapered to the SE. During the afternoon of 4 June, Fijian naval vessels collected samples of the pumice from just inside the Tonga entrance to Vanua Balavu (17.3°S, 178.9°W), an island of the Lau Group about 135 km ESE of Vanua Levu, one of the two main Fiji islands. Pumice fragments in this area were greenish-gray, ranged from 2.5-500 cm across, and carried coarse barnacles 0.5-0.7 cm long. There have been no reports of pumice washing ashore at any location but the samples were collected within the reef surrounding Vanua Balavu. The rate of drift of the pumice is estimated by Ronald Richmond at about 3 km/day, to the NW. Its source was apparently Late Island (see above), but residents of nearby islands in the Tonga chain did not report an eruption. A thick, odorless haze covering the Tonga and Fiji Islands early in the week beginning 6 May reduced visibility to 3 km or less in Nandi, Fiji. Such haze is very unusual in this area and may have been caused by volcanic activity. On 10 May, what appears to be a volcanic plume could be seen on NOAA weather satellite imagery, drifting SE from about 18°S, 174°W between 1200 and 2100-2200, when the source of the plume was cut off. However, an earlier eruption must be postulated as the source for at least some of the pumice, given the sighting on 10 May. Information Contacts: R. Richmond, Mineral Resources Dept., Fiji; Capt. Gallagher and T. Sutherland, Polynesian Airlines; N. Cherkis, US Naval Research Lab; A. Krueger, NOAA. The pumice . . . continued to drift in a generally westward direction in June. In mid-June, patches of pumice were reported near Vanua Balavu, Katafaga, and Yacata, small islands at the N end of the Lau Ridge (figure 1). The pumice at Yacata formed a strip 5 km long but only about 5 m wide. Large quantities of pumice were seen during the same period around Late Island (18.81°S, 174.65°W), about 400 km ESE of the Lau Group. Figure 1. Map showing the distribution of floating pumice between Tonga and Fiji, and the locations of volcanic activity in Tonga, May-June 1979. Historically active volcanic centers are indicated by crosses. Stippled zones delineate water < 1 km deep. Trench depths > 6 and 8 km are indicated by diagonal and cross-ruled patterns. Original map by T. Simkin adapted by Woodhall (1979). The source of the pumice remains uncertain. In mid-May, streaks of pumice extended back to Late Island from the main raft and the island's cone was covered with white material, which was thought to be fresh ash (04:05). However, activity has been reported at three other sites along the Tonga Arc in May and June. A Tongan vessel reported a strong eruption between 0700 and 1200 on 19 June at 19.18°S, 174.83°W, in the area of Metis Shoal, a frequently active submarine volcano that last erupted December 1967-January 1968. The vessel's crew observed a mushroom cloud climbing to about 1.5 km and saw the sea steaming. At about the same time, the MV Niuvakai (enroute from Auckland, New Zealand to Samoa) passed Metis Shoal, reporting an eruption column a little less than 200 m high at 0754. Captain Robert Jones of Air Tonga flew over Metis Shoal late the next morning and saw rocks ejected to about 150 m altitude as water boiled vigorously around the center of the eruption. During subsequent flights, Captain Jones observed a growing area of tephra, either an island or a mass of floating pumice, around the eruption site. He estimated its diameter at 3 km on 21 June, 8 km on 22 June, and 16 km on 24 June. Many moderate seismic events, most shallow, occur each month in the Tonga Arc. Events, in table 1, recorded by the worldwide seismic net (WWSSN) between late April and early June, had epicenters near one of the reported eruption sites. Data are from the USGS-NEIS, published in their Preliminary Determination of Epicenters. Table 1. Events recorded by WWSSN between late April and early June 1979 with epicenters near one of the reported eruption sites. Data are from the USGS-NEIS, published in their Preliminary Determination of Epicenters. A research vessel, carrying geologists from Fiji and Tonga, left Fiji on 3 July. Each of the reported eruption sites along the Tonga Arc will be investigated and pumice floating in the area will be sampled. Many moderate seismic events, most shallow, occure each month in the Tonga Arc. Nine events between 28 April and 1 June had epicenters near one of the reported eruption sites (table 1). Further Reference. Woodhall, D., 1979, Cruise of the R.V. Bulikula to Investigate Recent Volcanic Activity in Tonga, July 11-18, 1979; Fiji Ministry of Lands & Mineral Resources, Mineral Resources Division Report 14. Geologists aboard the RV Bulikula inspected the volcanoes along the Tonga Arc between 3 and 21 July. A new island, named Late Iki, had formed above Metis Shoal at 19.18°S, 174.85°W, site of strong activity in June. The new island, comprised of tephra ranging in size from ash to large bombs, was ~300 m long, 120 m wide, and 15 m high in mid-July. Emission of hot ash continued from the E end of the island. Short-lived islands were also formed over Metis Shoal during the eruptions of 1858 and 1967-8. The position determined (by satellite navigation) for the new island is approximately 1 km E of the one formed in 1967-68 (Melson and others, 1970). That island, estimated to have been 700 x 100 m and 15 m high, was eroded away within a month of the eruption's end. No new pumice was being ejected by any of the volcanoes along the Tonga Arc. Reference. Melson, W., Jarosewich, E., and Lundquist, C., 1970, Volcanic eruption at Metis Shoal, Tonga, 1967-1968, description and petrology: Smithsonian Contributions to the Earth Sciences, no. 4, 18 p.
Information Contacts: R. Richmond, Mineral Resources Dept., Fiji. Some fumarolic activity continued to take place during August on Late Iki. Geologists do not expect the island to persist for more than a few months. Reports from Rotuma Island (12.5°S, 177.08°E, about 1,150 km NW of Late Iki) state that a thick blanket of pumice washed up on the S side of the island in mid-August. Fish that jumped out of the sea and landed on the pumice were unable to return to the water. No other reports of pumice have been received by the Fiji Mineral Resources Department in August. Floating pumice, presumably from the recent island-forming eruption of Metis Shoal was reported at two widely separated locations during October. 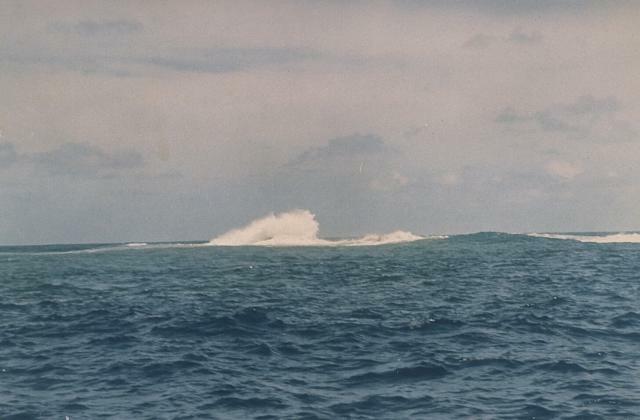 On 6 October, Samuel Iko, aboard the MV Independence, observed a blanket of pumice floating between the islands of Guadalcanal, the Florida Group, and Malaita (Solomon Islands), with the greatest concentration at about 9.5°S, 160.5°E, approximately 3,000 km WNW of Metis Shoal. Other reports indicated that pumice washed ashore at Marau, an islet at 8.5°S, 159.5°E, as the raft moved southward through the Solomons. On 25 October, John Carney sighted dark friable pumice on the beach on the S coast of Efate Island, New Hebrides (17.8°S, 168.5°E), about 1,850 km W of Metis Shoal. This is the first known observation of pumice from Metis Shoal in Vanuatu, the island that formed over Metis Shoal, were made in early October. At that time, the island had nearly disappeared beneath the ocean's surface. Information Contacts: D. Tuni, Ministry of Natural Resources, Solomon Islands; J. Carney, A. MacFarlane, Geological Survey, Vanuatu; R. Richmond, Mineral Resources Dept., Fiji. Most of the reported eruption sites were investigated during the 11-18 July cruise of the Fijian research vessel RV Bulikula. Deni Tuni reported that pumice arrived at the following Solomon Islands locations (figure 2) on the following dates: Malaita and the N and E shores of Santa Isabel, 1 October; Indispensable Strait and Guadalcanal, 6 October; Savo and the Russells, 18 October; and the SW shore of Rennell, 13 November. Figure 2. Sketch map of the Solomon Islands, showing locations and dates of pumice arrivals from Metis Shoal eruption, October-November 1979. Information Contacts: D. Woodhall and R. Richmond, Mineral Resources Dept., Fiji; D. Tuni, Ministry of Natural Resources, Solomon Islands. On 6 June the Hydrographic Office in Tonga notified the New Zealand Hydrographic Office that an eruption was in progress at Metis Shoal (figure 3). The NZ Hydrographic Office then issued a Long Range Navigation Warning to all shipping. The ship Obtfriesland reported the shoal in eruption while passing on 9 June at 1050. At least five volcanic ash aircraft advisories were issued by the Wellington Volcanic Ash Advisory Center on 12-13 June. The notices stated that the eruption began early on 12 June, apparently the time of the first plume report by an aircraft. Ash was reported up to 18-24 km. Drift directions of the plume changed in each notice, with estimated speeds of 28-46 km/hour. Figure 3. Map of the Tonga Islands, showing the island groups and location of Metis Shoal, which re-emerged as an island in June 1995. An island breached the surface ~12 June, but the growth of a lava dome above sea level was first observed on 14 June. A video taken on 14 June by a local tour operator (Allan Bowe), ~400-500 m away from the new island, was widely distributed by television news organizations. The video narrator noted that the water around the boat was discolored green. Based on the video and photographs, Brad Scott estimated that the dome was ~30 m high with a diameter of 150-180 m. The volume of the lava dome was estimated at ~1 x 106 m3, giving a daily extrusion rate of ~1 x 105 m3. Ash-laden eruptions seen on the video discharged from two sources. The first was directed NW, apparently from the dome wall. The second generated stronger explosions vertically from the dome center to heights of 300-500 m. The NNE face of the dome was steaming vigorously from what appeared to be parallel vertical sources, probably fractures in the advancing flow front. The steam plume, originating from the N and S sides of the dome, was rising 500-800 m before being blown downwind for several kilometers. By 20 June the lava dome was 240 x 280 m in size (67,200 m2) and ~54 m above sea level; the next day it was an estimated 200-500 m across and 50-80 m high. The volume of the dome was estimated at ~2.8 x 106 m3, three times that on 14 June. The daily extrusion rate during 14-21 June was ~4 x 106 m3, a 4-fold increase over the 6-14 June period. During 20-21 June a white steam plume rose as high as 1-2 km, and occasional small explosions produced ash columns to ~500 m. The active vent was in the SE corner of the island. On the evening of 20 June, the growing NE front of the dome was incandescent, and some observers reported that the summit was pulsing 3-5 m vertically. A small lobe was extruded onto the top of the dome and the NE front of the dome was active. Phreatic explosions occurred at the flow front. The dome changed overnight on 20-21 June, moving downward and NE. The steep-sided lava dome split and subsided between 21 and 25 June. Another aviation volcanic ash advisory on 21 June noted a report of ash below 24 km in the vicinity of the volcano drifting SE at ~18-19 km/hour. On 23 June the Tongan government asked the New Zealand government for advice on the eruption. As a result, Brad Scott (IGNS) joined a Royal New Zealand Air Force maritime patrol flight on 25 June. He reported that by 25 June the elliptical dome, ~300 x 250 m, elongate NNE, and ~50 m high, had stopped growing.Trending NW was a raised platform ~150 x 80 m, and 2-3 m above sea level. The lobe formerly on top of the dome had been displaced ~40-50 m NE and was lower than the highest point, which then stood on the S side. Blue fume emissions from a depression in the central part of the dome indicated a high SO2 content. A circular lobe of lava to the NE overlay a strongly ribbed flow front. Zones of discolored water (yellow-brown) extending outward from the volcano apparently represented submarine fumarolic discharge. Scott traveled on a tugboat near the island on 28 June. Steam emissions had decreased appreciably since 21 June, but the dome profile appeared unchanged since the 25th, indicating a significant decline in the eruption rate. Assuming a diameter of 280 m and a height of 43 m on 28 June, the erupted volume was calculated to be ~3 x 106 m3. No pumice has been observed, in contrast with past eruptions. The 1967 and 1979 events erupted dacitic pumice and formed low-angle tuff cones, which were soon eroded away. The current lava dome appeared solid in late June, and may resist erosion for some time. Two other eruption locations reported by aircraft were investigated, but nothing was found; those sites were apparently the aircraft locations at the time of the observations. The Tongan government was advised to place a restricted access zone around the island, and was briefed about acid rain/fume, explosive outbursts, dome collapse, and the formation of further shoals. Metis Shoal is located in the Tonga Islands about halfway between Kao and Late, ~50 km NNE of Kao (figure 3). Eight previous episodes of activity are known since 1851; new islands were created on at least three (1858, 1967, and 1979), and possibly five, of those occasions. The 1967-68 island appeared around 11 December 1967, and had submerged again by 19 February 1968 (Melson and others, 1970). In 1979, large pumice rafts were first seen in May between Tonga and Fiji. Metis was seen in strong eruption in June, with ash emission in July, and fumarolic activity in August. The island, named Late Iki by the Tongan government, disappeared in October 1979 (SEAN 04:05-04:08, 04:10, and 04:12; see Woodhall, 1979, for more details). References. Melson, W.G., Jarosewich, E., and Lundquist, C.A., 1970, Volcanic eruption at Metis Shoal, Tonga, 1967-1968: description and petrology: Smithsonian Institution Press, Smithsonian Contributions to the Earth Sciences, no. 4, 18 p.
Woodhall, D., 1979, Cruise of the R.V. Balikula to investigate recent volcanic activity in Tonga, July 11-18, 1979: Fiji Ministry of Lands & Mineral Resources, Mineral Resources Division Report 14, 13 p.
Information Contacts: Brad Scott, Volcano Surveillance Manager, Institute of Geological & Nuclear Sciences, New Zealand; Bureau of Meteorology, Northern Territory Regional Office, POB 735, Darwin NT 0801, Australia. Metis Shoal, a submarine volcano midway between the islands of Kao and Late, has produced a series of ephemeral islands since the first confirmed activity in the mid-19th century. An island, perhaps not in eruption, was reported in 1781 and subsequently was eroded away. During periods of inactivity following 20th-century eruptions, waves have been observed to break on rocky reefs or sandy banks with depths of 10 m or less. Dacitic tuff cones formed during the first 20th-century eruptions in 1967 and 1979 were soon eroded beneath the sea surface. An eruption in 1995 produced an island with a diameter of 280 m and a height of 43 m following growth of a lava dome above the surface. Baker S W, 1885. A description of the new volcano in the Friendly Islands, near Tongatabu. Trans New Zeal Inst, 18: 41-46. Melson W G, Jarosewich E, Lundquist C A, 1970. Volcanic eruption at Metis Shoal, Tonga, 1967-1968: description and petrology. Smithsonian Contr Earth Sci, 4: 1-18. Phillips C, 1898. The volcanoes of the Pacific. Trans New Zeal Inst, 31: 510-551. Scott B, 1995. (pers. comm.). Taylor P, 2003. Unreported submarine activity at Metis Shoal, June 1991 and the risk from future activity. Aust Volc Invest Occ Rpt, 03/05: 1-9. Thomson J A, 1926. Volcanoes of the New Zealand-Tonga volcanic zone--a record of eruptions. New Zeal J Sci Tech, B8: 354-371. There is no Deformation History data available for Metis Shoal. There is no Emissions History data available for Metis Shoal. Waves break over Metis Shoal on February 19, 1968, more than a month after the end of a submarine eruption that began in December 1967 and produced an ephemeral island. Metis Shoal has produced a series of small islands during eruptions observed since the mid-19th century. Most recently, an eruption in 1995 produced a lava dome that built up to 43 m above sea level. Photo by Charles Lundquist, 1968 (Smithsonian Astrophysical Observatory). IRIS seismic stations/networks Incorporated Research Institutions for Seismology (IRIS) Data Services map showing the location of seismic stations from all available networks (permanent or temporary) within a radius of 0.18° (about 20 km at mid-latitudes) from the given location of Metis Shoal. Users can customize a variety of filters and options in the left panel. Note that if there are no stations are known the map will default to show the entire world with a "No data matched request" error notice. Large Eruptions of Metis Shoal Information about large Quaternary eruptions (VEI >= 4) is cataloged in the Large Magnitude Explosive Volcanic Eruptions (LaMEVE) database of the Volcano Global Risk Identification and Analysis Project (VOGRIPA).